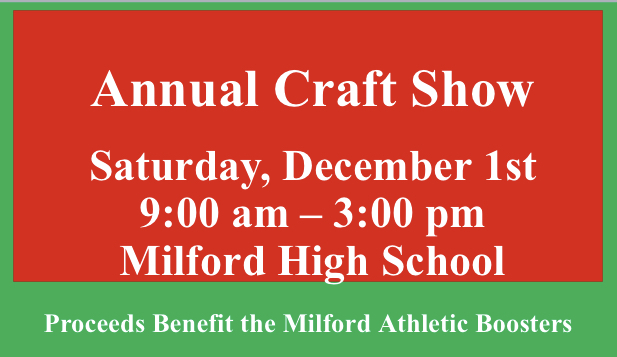 The annual Milford Athletic Boosters Craft Show is held on the first Saturday of December every year at Milford High School. Milford High School is located at 1 Eagles Way, Milford, Ohio and is accessible from either St. Rt. 131 or Pleasant Hill-Wolfpen Rd. The craft fair encompasses almost the entirety of the high school building including the cafeteria, two gymnasiums, the Fley Center, Bauer Commons and many hallways throughout the building. The 300+ crafters exhibit their broad spectrum of products including, but not limited to, sewn items, embroidery, quilting, knitting, glass etching, painting, wood crafts, candles, handmade soaps, lotions, stuffed Santas, elves, doll clothes, floral arrangements, holiday décor, hair embellishments, jewelry, purses, alpaca products, dips & seasonings, photography, baby items, roasted almonds and pecans, homemade candies, dog treats, etc. This is a ‘craft only’ event with no manufacturer’s representatives or consultants permitted. Milford High student-athletes volunteer to assist crafters with their set up and tear down. This event has been a major fundraiser for the athletic boosters for about 40 years. The Milford Athletic Boosters volunteers staff the cafeteria for the day to serve breakfast, lunch, snacks, drinks and baked goods. Doors open for shoppers at 9 am and the craft show closes at 3:30 pm. Admission is $2 and parking is free. Please no strollers. Participation in the craft show is by approval via email only at director@milfordcraftshow.org. Due to the size of our show, we are unable to accept phone calls to the director. Please do not contact the school offices or athletic department regarding information about the craft show. Booth sizes are as follows: 8x5’s located in the hallways, 11x5’s in the small gym, café and front hall, 15x5’s in the cafeteria, Fley Center, Bauer Commons and large gym, and the 10x10’s (a very limited number) are in the large gym and cafeteria.